(Newser) – Little Henry Bochenski of Elk River, Minnesota, is going to have an amazing story of a lucky escape to tell when he gets a little older. 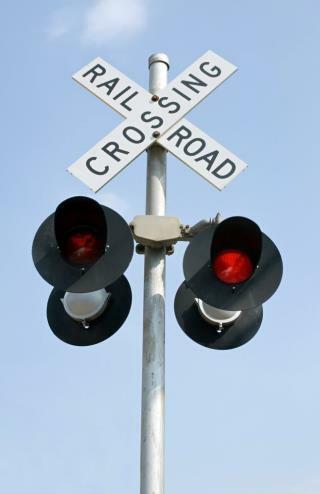 The 15-month-old was in the back of his mother's car Monday morning when it was hit by another vehicle at a railroad crossing, sending it straight into the path of an oncoming train. Anja Bochenski tells the St. Cloud Times that the car accident disabled the car and the doors wouldn't open, so she had to crawl out of a window. With the train rapidly approaching at 60mph, she could only wave frantically for the driver to stop, then watch in horror as it struck the front right side of the car, causing it to spin off the road, reports CBS Minnesota. love love love it when things like this turn out ok in the end! god bless! Whoa. Check out the picture of the damaged car. (CBS Minnesota link). Hey mom? You and baby are kind of cute and I'm glad things turned out well for you. But leaving your baby to be hit by a train? Not a story that will build trust later on. Stick with the "12 hours of labor" story. This is truly a great story. I can't help but praise God for creating the people that study science and make our lives safer every day.